I have always wanted to fly Air Deccan - The legend which made the dream of middle class men(and women) to fly a reality. But by the time I started earning enough to fly Air Deccan was a thing in the past - I got on board Kingfisher Red for my first flight Cochin- Bangalore - I still remember the date. Then I heard that Air Deccan is coming back - Under UDAN (Udte Desh ki Aam Nagarik) . I started following Air Deccan closely. Then I heard the wonderful news – Air Deccan has got contract to operate some sectors under UDAN. The one closest to me was Mumbai based operations. Further research revealed the cities connected to be – Mumbai – Nashik, Nashik -Pune, Jalgaon etc. The only cities that I wanted to visit and make some sense were Mumbai and Pune. I started searching and became a regular in the website to check on schedules. I wanted try so badly and then an oppuurtunity presented itself. I was supposed to take a training in Pune. Yaaay!!! I am to travel from Cochin-Pune, I informed my office and told them to reimburse me the fare and I am to make my own arrangement. The next step was to call Air Deccan – I asked them if its possible for me to fly Mumbai -Pune via Nashik and they said ofcourse! I was asked to book the flights separately and to send them a mail to ensure both my boarding passes are ready at Mumbai. The process was simple and no frills. For a small airline which operates three 19 seaters aircraft I was even impressed. Although 2 days before my intended flight the website went down and I was worried to point that I though Air Deccan has ceased to exist. A quick call to them revealed that its just a tech issue and they are working on it. One thing about flying a small Airline – They do know who is calling – In fact I both the agents I spoke to during the umpteen calls I made know my details and there was no need for much authentication. My brother was also posted in Pune which meant that I can spend some time with him. He was very pissed at me (a) not taking a direct flight to Pune (b) Almost spending 8 hours in Mumbai airport by which time I could have reached Pune in bullock cart (Well he feels so). He made it a point to call me atleast twice and tell me that You would have been home had you come even by bus from Mumbai. Well its hard for him to understand what I was feeling. The thing about small Airlines the counter wont be open most of the time also the security personnel eyes you with suspicion. 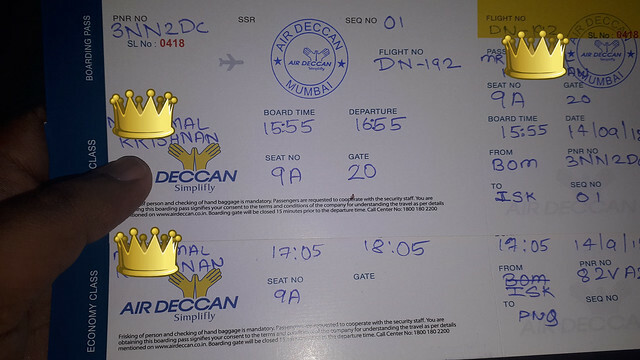 The deccan ticket also mentioned Ozar Airport (ISK) and no mention of Nashik – That also meant questioning me about my destination and checking departure boards also. The one in transit point did not even let me pass. He asked me to get out and enter through the Departure side. I tried to change my seat in the airline – This was just to see how many people have booked into the flight since the occupied seats will be marked and at that point I was the only one flying. I got scared, A lot of scenario passed through my mind. My brother being as helpful as he is also told me that in case the flight gets cancelled I will be stuck at Mumbai and would have to take a bus that would lead to my Mumbai to Pune journey which sane people undertake in 4 hours to be 12 hours – 8 hours wait plus the 4 hour commute – The words of inspiration made me swet like a pig and I tried to get out of terminal which the sweat CISF personnel(NOT!) did not let me. 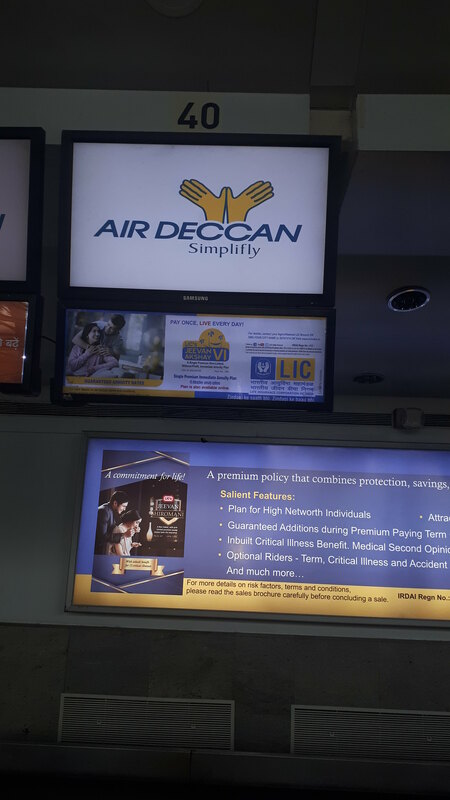 I told them its just to goto the Air Deccan ticketing counter to confirm on my flight and that there is no staff in the counter. They did not let me even then. I was so pissed I tried to find a feedback to give feedback on rudeness. They I decided that I have better things to do – sit eat and pray . I called the customer care number and they confirmed Yes! The flight is operating and yes they know I am through to Pune they have informed everyone of that. Yes I don’t have to worry I will get my checkin bag in Pune. Reassured I went to some shop to have something to eat. I am a stress eater and by this time I was hungry – I tried having some food and realized Mumbai Airport is not the place to be if you are hungry. Its very costly and I cant in pure consciousness buy a burger for 300 or so unless it’s a nice comfortable café. So I just had a tea which was reasonable and have some more tea and more. The checkin process was very easy -Seeing as to I am the only person waiting. I gave both my tickets and the staff started writing my boarding pass – I remembered that the last time I got such a boarding pass was when I flew in Air Pegasus – BLR-TRV and they did not fly for much longer. I compartmentalized that thought and thought of how Air Deccan dominated the sky once and for once again shall do that. It took some time to write the boarding pass . Ofcourse I was sequence 1. Both my boarding pass were handed over and then I saw something very funny. The agent was writing the baggage tag as well – Both the piece to hand over to me and the other one. I waited in the designated gate and saw the agent coming in a while before boarding . It was the same person who helped with the checkin. He asked me to board the bus and slowly all the 4 passengers bound to Nashik boarded the bus. I saw a beautiful golden Beechcraft 1900D and assumed it’s a business jet but that was the designated aircraft for the day. The aircraft is a beauty. The aircraft looks like a private jet. As soon as we boarded the door was closed and the engine started . There was one crew and another staff onboard this flight. The air hostess tried to do a safety demonstration but the whirring on the engine made sure that most of us did not hear a word. She also distributed water before take off and her duties were done. The cockpit was closed by a small door which remotely reminded me of the half doors you see in the Principal’s office . Before take off we were offered water bottles. 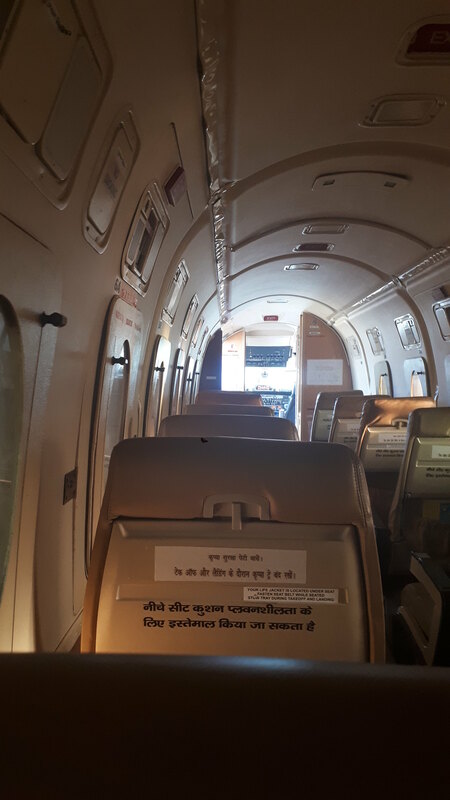 Eventhough in another post (https://www.cntraveller.in/story/heres- ... ir-deccan/) it mentions that the Air Hostess asked to hold using the wash room till landing unless its an emergency that was not the case. We landed well before time in Nashik and the long wait ensured. We were well before time and had to wait for a long time. There was an II-78 which was getting ready for take off and this wait ensured that I was able to see the take off. It was weird that the tail number of the flight was still Russian, So not sure it’s a Russian one even though it had the IAF ensign in it . 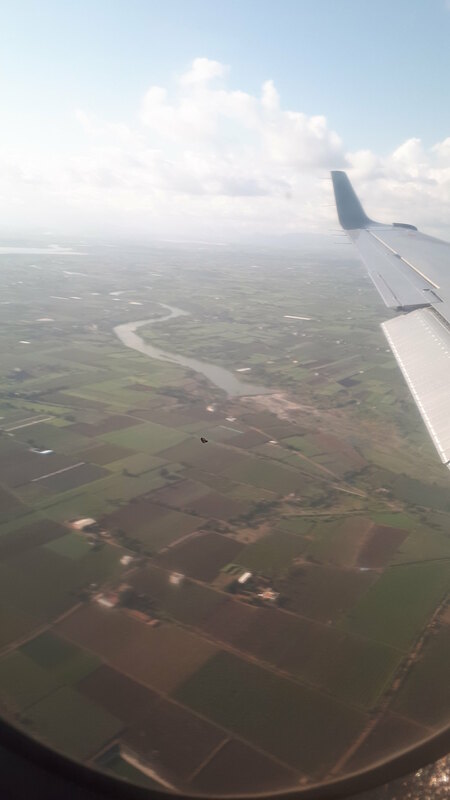 We took off from Nashik on time and reached Pune before time. Both the flights were uneventful. The baggage was to be received at a conveyer belt and there were only 5 pax from Nashik so needless to say we all got our baggage in seconds. Overall it was a very pleasant experience flying Air Deccan and I am glad that the Deccan is back. Oh wow! I did not know that Air Deccan had recommenced operations, although as a different guise now, with a Beech 1900! That is indeed quite a unique experience and hopefully get to fly it one day. It has been quite a while since my last Beech flight, 4 years ago. Nice TR, always great to read from such "exotic" airlines and places! Thank you for a nice TR and for bringing back good memories. When I was doing my IB in Bangalore for 2 years I used to fly Air Deccan all over India - for a student they really offered the chance to explore India! I recall flying from BLR to DEL and then fly KingFisher to LHR...really enjoyed both of these 2 airlines. Unfortunately Air Deccan is once again in dire straits. It has discontinued the sector mentioned in the report and is likely to shut shop very soon. Pity Air Deccan were not able to sustain this. But it looked like you had a fun time aboard the Beech 1900 - thank you for sharing this! Seeing as you were so close to the operations, did anyone oppose to your taking pictures? No challenge as such. I was asked not to take photos in Nashik and Pune since they are military aircraft. Hence I missed taking the photo of the IL78 take off. Looks like all these UDAAN flights are really a struggle to keep up. Even Supreme Airlines out of Jaipur now trimmed their flights till just 2 destinations. Yeah. 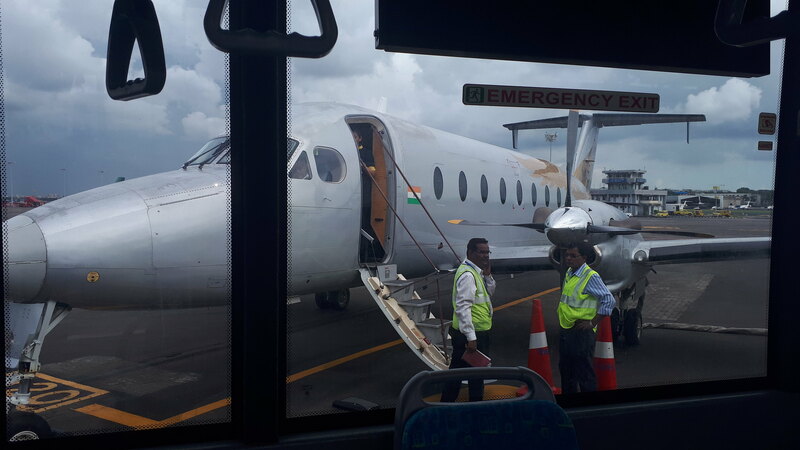 I think UDAN Scheme was not well thought through. I read a report that Air Deccan got only 2 slots in Mumbai againist the requirement of 6 slots. Also the small plane also means low pax on board and lesser revenue. In both my flights the revenue was under 10k since there were only 4 pax on both the sector. Pretty sure they cant survive with that much amount.